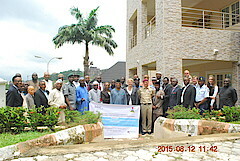 BICC held a two-day training course on physical security and stockpile management in Abuja, Nigeria on 12 to 13 August 2015. This training session was organised in conjunction with the Nigerian Presidential Committee for Small Arms and Light Weapons (PresCom). As indicated by evaluation forms distributed at the end of the course, feedback from the event was positive. Furthermore, the armorers who were among the participants agreed to go back to their depots and submit an outline of their needs to PresCom. These needs assessments will be shared with BICC in due course.